This simple kale recipe makes for a delicious and nutritious side dish for a roast or can make for light meal in itself. While summer is a time to graze on salads, the craving wanes as the season grows cold. Even if I did have a mid-winter freak craving for salad, January is hardly the time to find good local salad greens. That’s why I turn to kale during the long New York winter to fulfill my herbivorous needs. Compared to spinach, kale has over 3 times the amount of Vitamin A and almost 10 times the amount of Vitamin C, making it a little powerhouse of nutrients that actually tastes good… Yes, you read that right, I said it tastes good. Kale like many other greens gets a bad wrap because it’s often prepared wrong. Undercook it, and kale is like a sheet of green papyrus. Over cook it, and it turns into brown mush that smells of sulfur. But when cooked properly, it has a great toothsome texture with a verdant flavor that makes for a great warm substitute for salad. The trick to getting it tender without overdoing it is to first sauté it, then cover it with a lid to steam it, finishing it off without the lid to burn off some of the moisture. It’s great with garlic or shallots, but for this version I’ve toasted some pine nuts in the oil before adding the kale, then added some raisins soaked in vermouth for sweetness. 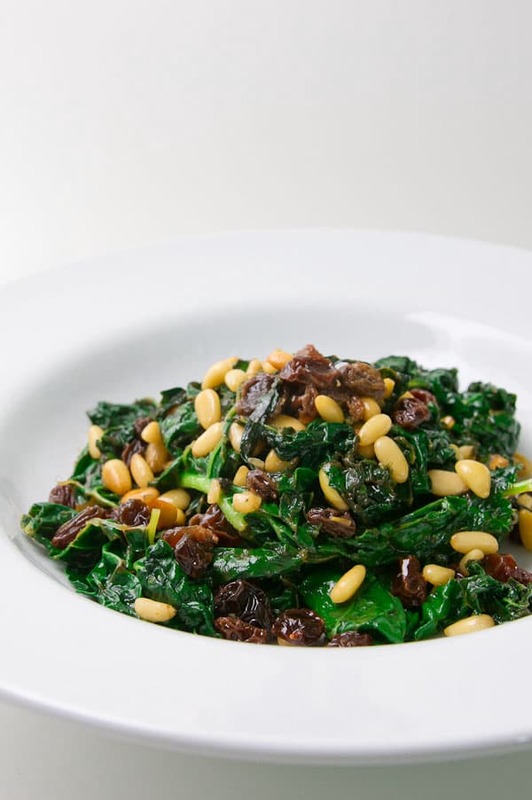 The booze soaked raisins end up tender and moist, while the toasted pine nuts add a wonderful earthy flavor and richness to the kale. This dish has enough substance and protein to be a meal on its own, but I served it with my Crispy Caraway Roast Duck. Put the raisins in a small ramekin and cover with vermouth. Let this sit until the raisins are plump and there is little to no liquid remaining. Strip the kale leaves from the tough stems by holding the stem and pulling the leaves away along the stem with your other hand. Tear the kale into bite sized pieces. Thoroughly wash the leaves. Heat a large sauté pan over medium high heat until very hot. Add the olive oil, then add the pine nuts. Fry the pine nuts until they are golden brown and fragrant. Add the kale, then drain the raisins and add those too. Turn down the heat to medium low, cover and cook for 5 minutes. Remove the lid, salt and pepper the kale to taste, then continue frying until the kale is tender enough to eat, but not mushy. Remove the kale from the heat and give it a squeeze of lemon juice for a little zing. Wow, kale is my new favorite winter recipe. Your preparation is fantastic – and your photo is brilliant! Nice idea to soak the raisins in vermouth. They must taste amazing. This is great Marc…love the combination of raisins and pine nuts. Delicious! We make this at home too – you’ve essentially got a very Catalan style preparation here! Kale is under appreciated, don’t you think? I am a kale convert. Thanks for this easy and delicious looking recipe. I usually eat kale raw–this is like a real meal! I can eat kale all the time. It is so good for you. This version is savory and sweet. Again, another recipe for my vegetarian clients. Keep them coming. Yum, kale. One of my favourite winter dishes is braised kale with pasta. Exactly like this with pine nuts. Sounds lovely with duck! Gorgeous photos, like I am right there! I make this all the time, sans the Vermouth. my o my! i haven’t had kale in so long. looks great! nice combo of flavors and texture. I’ve been experimenting with kale in this cold season too. It’s nice and hearty to gear me up for a couple hours of snow shoveling. Kale. I love it as much as chocolate some days. Raisins and nuts are such great foils to its bitter softness. Did you know pine nuts have quadrupled in price? At least where I am. I bought some the other day but I’m almost regretting it they were so expensive. Thanks Marc! I’ve been eating kale for years but never knew how to cook it. Usually just it raw as a salad green. Very excited to now try it like this! Yum! Thank you for another great kale recipe. Please check out fellow foodie, comida es me vidas, Kale and creamed mushroom, you will love it. Can’t wait to try yours. A great way to enjoy a healthy helping of greens. I really like the sweet and savory in this dish. This recipe sounds fantastic! I’ve also scoured the internet looking for recipes for cooking whole roast duck and have been disappointed….until now. Can’t wait to try this one…along with the kale, pine nuts and raisins…thank you! I love your food. I am Vegan and I find a ton of inspiration just looking at your pictures. YOU ROCK!!!!! What a very pretty dish this is! I am impressed with almost everything that is in it. I love the colors! awesome! enjoying this dish right now. In lieu of vermouth I used vodka, it seems like to great effect – the rasins stayed moist and plump. I would probably up the pine nuts the second time around (in the no-recipes-spirit I didn’t follow marc’s amount guidelines) for a more focused “earthy” flavor, which ends up being almost necessary to contrast the sweet raisins. Another great substitute for the vermouth would be Marsala wine.